Anti-Wrinkle Lifting Day Cream 40+ is produced by Ukrainian beauty brand Dr. Sante for its ArganOil skincare line. The product is based on an innovative formula with anti-age ingredients that stimulate regeneration of the epidermis and slow down the ageing process. Specifically designed for mature skin (40+). The formula of Dr. Sante’s Anti-Wrinkle Lifting Day Cream has been developed taking into account the peculiarities of mature skin, such as decreased collagen production and being prone to dehydration. A key active ingredient contained in the product is argan oil. It is considered one of the most valuable carrier oils used in skincare. Argan oil is rich in unsaturated fatty acids, tocopherols (vitamin E) and other nutrients that help to keep the skin hydrated, make it softer and smoother, reduce wrinkles, and protect the skin from harmful environmental factors. The effect of argan oil is complemented by coenzyme Q10, also known as ubiquinone. It is one of the most widely used anti-age cosmetic ingredients. Coenzyme Q10 normalises skin cell metabolism, neutralises the harmful effects of free radicals, improves skin elasticity. Other anti-age ingredients that can be found in the cream include vitamin E and GP4G (a patented rejuvenating complex). They moisturise the skin, prevent dehydration and flaking, improve face contour, and stimulate collagen and elastin synthesis. Free of artificial dyes and mineral oil. Directions. Apply to clean, dry skin of your face and neck. Massage lightly until absorbs. Can be used as a make-up base. Ingredients. Aqua, Glycerin, Stearic Acid, Cocos Nucifera Oil, Propylheptyl Caprylate, C12-15-alkyl Benzoate, Dimethicone, Cetearyl Alcohol, Glyceryl Stearate, Cyclopentasiloxane, PEG-100 Stearate, Dimethicone/Vinyl Dimethicone Crosspolymer, Silica, Tocopheryl Acetate, Argania Spinosa Kernel Oil, Hydrolyzed Collagen, Hydrolyzed Elastin, Bis-PEG-18 Methyl Ether Dimethyl Silane, Artemia Salina Extract, Ubiquinone, Xanthan Gum, Sodium Hydroxide, Parfum, Propylene Glycol, Tocopherol, Glycine Soja Oil, Phenoxyethanol, Methylparaben, Ethylparaben, Propylparaben, Butylparaben, Benzoic Acid, Sodium Benzoate, Benzyl Salicylate, Linalool. Want to buy Anti-Wrinkle Lifting Day Cream 40+? Call us or submit your order via our web site! 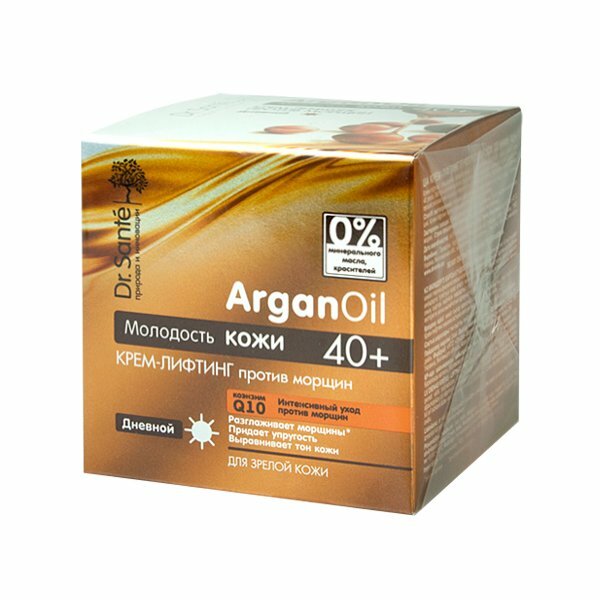 Dr. Sante ArganOil is a line of skincare products for mature skin produced by the group of companies Elfa (Ukraine/Poland) that has been one of Ukraine’s leading cosmetic manufacturers for almost two decades. The company’s products are also popular in Ukraine’s neighbouring countries and even in the Middle East. Elfa owns and produces several dozen personal care brands and product lines, including Ag-Plus, Cool Men, Elfa Pharm, Fresh Juice, O’Herbal, Bio Naturell, Camomile Depilartion, Dr. Sante, Aloe Epil, BIO Formula, BIO Nanny, BIO Green, Green Pharmacy, Lady Caramel, Pink Elephant 0%, Pink Up, Sun Berry, Sun Energy, Very Berry, and Home Doctor. The company operates plants in Ukraine, Poland and Slovakia, ensuring that its production process conforms to European quality and environmental standards. Dr. Sante ArganOil is a skincare line that is specifically designed to take care of mature skin (40+ and 50+). Its key ingredients include argan oil, coenzyme Q10, anti-age complexes GP4G and SYN®-AKE, hydrolysed collagen and elastin, and other compounds that improve skin elasticity, help to lock in moisture, and protect the skin from the harmful effects of free radicals and UV radiation.